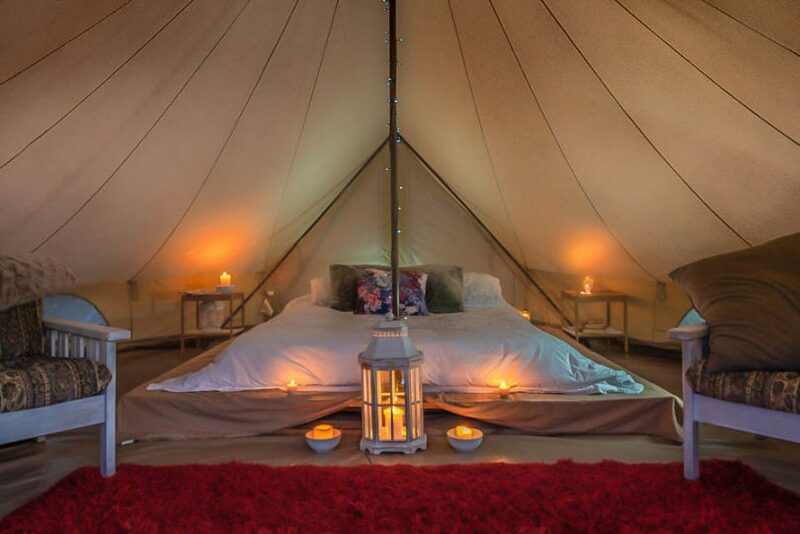 Dreamy… the Gulaga glamping tent at Mountain View Farm at Tilba Tilba. Photo Michael Weinhardt Photography. April is the best time to get out and enjoy our region, and while the Easter weekend is busy, a quick holiday or family break either side of it reaps great rewards. Lisa Herbert has been exploring the nature and nurture of South East NSW to bring you the best the region has to offer. If you’d like a magical stay in the verdant valleys of the Tilbas, visit Mountain View Farm. Situated at the base of Gulaga (or Mother mountain as she’s known locally) and decked out in beautiful manicured gardens, it’s a converted dairy farm to die for. I recently spent a relaxing night glamping in the Gulaga tent. I spent the afternoon alternating between watching galahs clown around on the acres of thick lawn, and staring at the Mother mountain herself. Then I explored the beautiful old dairy, where most of the glamping amenities are, and where you can occasionally catch live music. Here is the communal area with fridge, BBQ, wifi, kitchen, new toilet and showers, and a spring water fountain. I chatted to host Kathryn’s kids (and dog Sandy) about all the animals they’ve had as guests – dogs, cats, birds, and horses, there’s room for floats as well. On dusk, I retreated to the luxury of my very pretty tent. I slept better than I had for ages, waking once during the night to see the beautiful mountain against a backdrop of stars. It’s an image and a feeling I won’t forget. Mountain View Farm is perfectly placed for those wishing to tackle the half day Gulaga trek which is a must-do. Everything I needed to make coffee was provided for the morning, but I chose the two minute walk down a country lane to La Galette for a Cafe Latte and a fresh madeleine, how very French! Mountain View Farm has glamping options, two cabins, and a light airy studio, all fresh, clean and furnished in a simple, country style. Host Kathryn has a side business which is a very cool, retro ‘Oyster Van’, so you can order as many as you like and she’ll open them for you. While you’re in Tilba, visit the Aboriginal art gallery APMA Galleries, and for a healing and healthy half-day experience check in with Gulaga Walking Tours. Tilba Tilba is also close to Mystery Bay, Bermagui and Wallaga Lake. Spectacular, windswept and empty, Gillards Beach Camping Ground. Photo: Lisa Herbert. 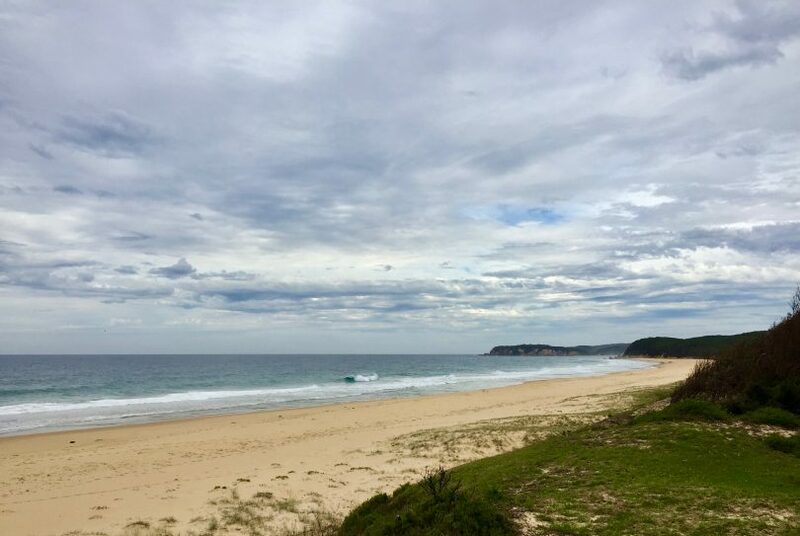 Gillards Campground is the perfect place for a family camping holiday, just north of Tathra, offering opportunities to go surfing, fishing and walking. Gillards is a beautiful camping spot, practically on the beach in the pristine Mimosa Rocks National Park. Bookings are not required, sites operate on a first-in-first-served basis, and a NPSW collector will come and see you for payment. There are no powered sites, which is my idea of a holiday. You can try your hand at fishing, then cook your catch on your own camp hot plate. Potoroos have been sighted at night time, and there is great bird watching. The sound of the waves will lull you to sleep. There are sites for tents, camper trailers, caravans and good facilities including toilets and regular rubbish collection. The water is still pretty warm in April, and Mimosa Rocks National Park has many gorgeous spots for swimming, walking and just watching nature. Check out Moon Bay and Nelson’s Beach and Lagoon or the Middle Lagoon track. Boydtown is on the shores of Eden’s Twofold Bay. Photo: Facebook. 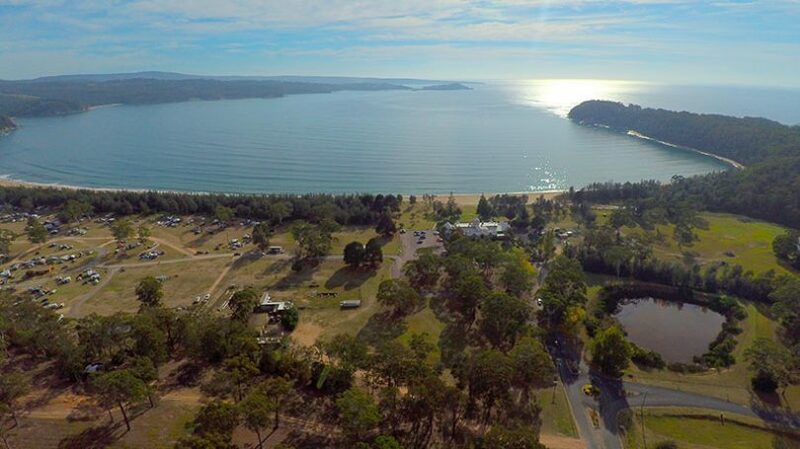 Beautiful Boydtown and its Beach Holiday Park is just south of Eden on the shores of Twofold Bay. With magnificent views across the glistening waters to Eden, the setting is stunning, and is accessible to the best on offer along the Sapphire Coast. This unspoilt coastline is famous for its crystal clear waters which are relatively warm in April, and the golden sands of Twofold Bay are natural and unique. There’s plenty of room to relax and enjoy the environment. It is one of the last parks where you can get back to nature with open fires all year round (except during total fire bans) and space to enjoy quiet time as a couple or with family and friends. The caravan and camping areas are absolute beachfront land with fishing, swimming, snorkelling, tennis, and bush or beach walks being amongst the more popular activities. 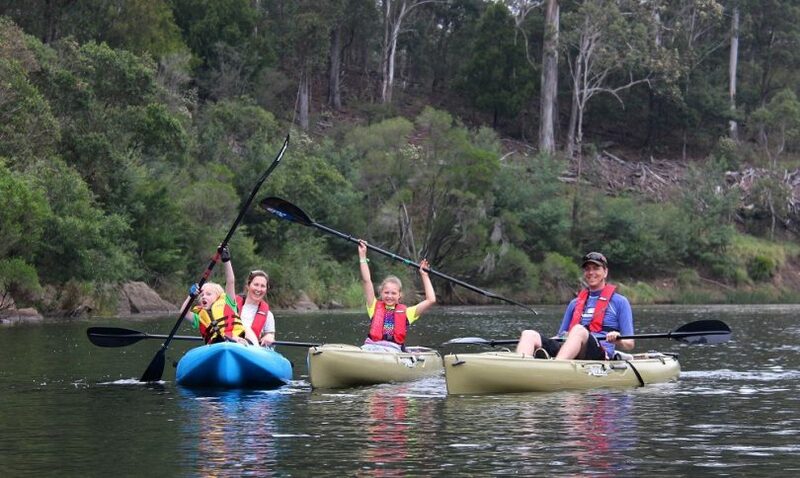 Kayaking on the calm waters with Kiah Wilderness Tours. Photo supplied. The remains of whaling stations and the local landmark Boyd’s Tower, a sandstone tower used to spot whales, are all nearby. It’s a great area to explore. Try the NPWS beautiful Light to Light Walk. Also visit great local museums- Killer Whale Museum and the Sapphire Coast Marine Discovery Centre or go paddling with Jenny at Kiah Wilderness Tours. If you’d like to spend some time exploring the Eurobodalla coast, perhaps put roots down in the centrally located Tuross Head and Potato Point. Surround yourself with water and wildlife at either Tuross Beach Holiday Park (North of the River), or Beachcomber Holiday Park (South of the river). Tuross Beach Holiday Park is small and peaceful with modern holiday units and also caravan and camping sites offering fabulous views of the ocean to Montague Island, the inlet and Tuross Lake. Direct and easy access to the beach and children can play in the pristine sandy spaces while you relax overlooking the beach from your balcony. 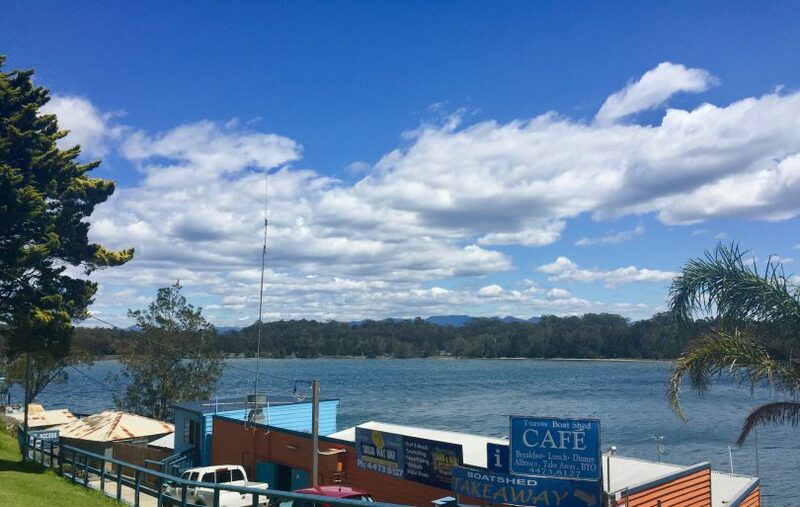 As well as the beach and rivers, there are many activities in Tuross Head and Batemans Bay is only 48kms away – you’ll also pass Mogo Zoo along the way. Nearby locations boast tennis, fishing, boating, canoeing, water skiing, swimming, surfing, cycling, bushwalking, horse riding, and fine dining. Check out Tuross Boatshed for coffee, fish and chips, and cakes, whilst dangling your feet in the waters…you don’t really need to roam too far. Feed the family, and the fish at Tuross Boat Shed cafe. Photo: Lisa Herbert. Don’t feel like heading to the ocean? Well then, the Snowy Mountains it is! 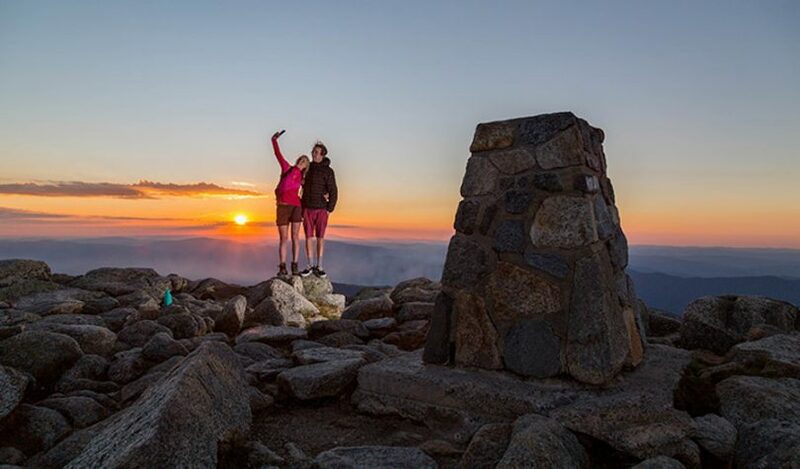 On top of all the planned school holiday activities in Snowy towns, you can take on a variety of hiking trails, make the family trek to the top of Mt Kosciuszko, try mountain biking, take a scenic chair lift ride to the top of Australia, or enjoy the fun Thredbo Leisure Centre filled with a waterslide and inflatables. Walk on the top of Australia this April. Photo: NPWS. 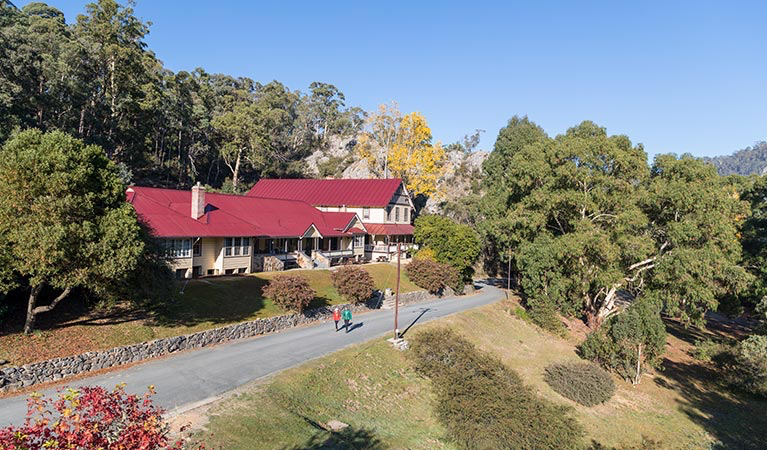 Stay in the cosy Yarrangobilly Caves House, the 1901 East and West wings offer self-contained heritage accommodation in a secluded section of Kosciuszko National Park. You’ll find scenic walking, skiing, fishing and a thermal pool right at your doorstep. The Yarrangobilly Caves’ thermal pool, fed by a natural spring, is accessible via a short walk. Inside the Jersey Cave, you will see incredible cave formations 1.5 million years in the making – Cleopatra’s Needle, a 4-metre column that reaches the ceiling, rare displays of black and grey flowstones, forests of stalactites and stalagmites; just a few of the highlights in this 1.5-hour guided tour. You can also make your own way in a self-guided tour of the South Glory Cave. Take a leisurely look through the lofty cave chambers and absorb the wonders of the largest cave in the Yarrangobilly system. Yarrangobilly Caves House, old world charm for sure, but get outdoors! Photo: NPWS. Check out other accommodation ideas for the Snowys here. South East NSW is at it best in Autumn, have a great time exploring this beautiful region and please share your thoughts and recommendations with us along the way. Did we miss your favourite spot? Give it a shout out in the comments below. Editor’s note: Lisa Herbert pays her own expenses. Reviews are honest and not based on a commercial relationship. Original Article published by Lisa Herbert on About Regional.